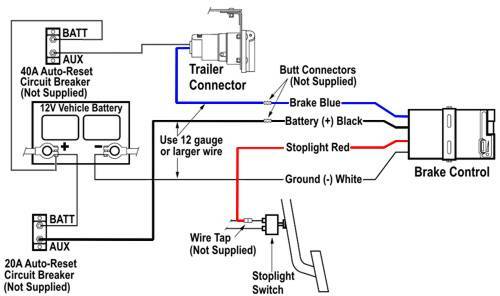 An electric trailer brake controller is a device that supplies power from the tow vehicle to the trailer’s electric brakes. Many styles are available that differ from how they look, to the number of brakes they can power, but all of them can be divided up into two main groups, Proportional or Time Delayed. A proportional (or pendulum) brake controller senses how quickly the tow vehicle is stopping and applies the same amount of braking power to the trailer. With a Time Delayed (or solid state) brake controller when you step on the vehicle brakes a predetermined amount of braking power is sent to the trailer and then there is a delay as the unit ramps up to full braking power. With proportional brake controllers, once the brake pedal is stepped on, a motion sensing device knows how fast the tow vehicle is stopping. It then applies power to the trailer brakes equally as fast (or slow) as the towing vehicle. This allows the trailer to stop at the same rate as the tow vehicle. Therefore, in an extreme stopping situation where the vehicle brakes are slammed on, a proportional controller will immediately send the maximum preset power to the trailer brakes. This type of brake controller provides the smoothest and quickest braking while also providing the least amount of wear on both the vehicle and trailer’s brakes. Proportional controllers are “enabled” by the brake pedal switch and “activated” by a pendulum circuit that senses the vehicle’s stopping motion and applies a proportional voltage to the trailer’s brakes. When properly adjusted the trailer will decelerate at the same rate as the tow vehicle, increasing braking efficiency and reducing brake wear. With Time Delayed trailer brake controllers, once the brake pedal is stepped on, the pre-determined amount of power (which is set by the user, based on trailer weight) is sent back to the trailer brakes. On time delayed controllers, a delay always exists from when the brake pedal is pushed to when the unit reaches the user set, maximum power output. The delay can be shortened or lengthened with the ‘sync’ switch, available on most time delayed controllers, but it behaves the same way for every stop (slow or fast). If the sync switch is set too low, the vehicle will do most of the initial braking, putting extra strain on the vehicle’s brakes. If the sync switch is set too high, the trailer will be braking harder. So in most cases, either the truck or the trailer will be doing the majority of the braking, resulting in uneven brake wear. The time delayed brake controller system is easily installed and is very user-friendly. It can be mounted at any angle. It also has a low profile. The amount of power that is sent back to the brakes is adjustable using a control on the brake controller. With most time-delayed brake controllers, when towing with the hazard flashers on, the digital display will flash with the hazard flashers. If the brake controller is set to aggressively, pulsing may occur which will be felt in the trailer brakes. However, a pulse preventer can isolate the brake controller from the flashers and will eliminate the pulsing and be flashing on the controller. A pulse preventer is not necessary for vehicles that have a different bulb for the stop and turn signals, which is typical of vehicles with amber turn signals. • Cost: Time Delayed will typically be less expensive, although recent advances in Proportional Brake Controllers have made the cost difference much narrower. • Braking Performance: Time Delayed always sends the same braking power to the trailer, Proportional will vary the braking power based on how quickly the tow vehicle is stopping producing a smoother braking action. • Wear and Tear: Time Delayed will cause more wear on either the trailer or vehicle brakes because one or the other will be doing the majority of the braking. Proportional reduces wear by spreading the braking power evenly. • Mounting: Time Delayed may be mounted in any position and at any angle. Proportional will typically need to be mounted within a certain range, such as within 70 degrees of level, to work properly. • Calibration: Time Delayed will typically not require calibration. Some models of Proportional brake controllers need to be calibrated to work properly, but most of the newer models are self-calibrating or have a very simple calibration, so they are nearly as easy to set up as time delayed. • Size: Time Delayed have traditionally been smaller and slimmer than Proportional, but newer models of proportional controllers come in shapes and size very similar to Time Delayed. • Use: Time Delayed is best for the casual user. Proportional should be considered if the trailer will be towed often because they operate well in diverse towing conditions and produce less wear on the braking systems. • Safety: Proportional brake controllers provide an additional level of safety because they will automatically ramp up to full power if the tow vehicle makes an emergency stop. 1. Trailer Feed (usually blue): This is the wire that supplies brake power for the controller to the 6-way or 7-way trailer connector at the back of the vehicle. Some vehicles with factory tow packages already have this wire run from under the dash to the rear of the vehicle. Otherwise, the wire will need to be run along the underside of the vehicle and through the firewall to the desired Brake Control mounting location. To get through the firewall, sometimes a hole must be drilled. However, grommets or pre-existing holes are already available in most vehicles. 2. Ground (usually white): This wire is connected to the brake controller to any reliable ground location. 3. Brake Switch (usually red): This can be found near the top of the brake pedal. There are wires extending from the switch and using a circuit tester, the wire that has power when the brake pedal is pressed can be found. This wire is tapped into using a scotch lock. 4. Battery Power (usually black): This is the connection that supplies power to the brake controller. Some vehicles with factory tow packages already have this wire run from under the dash to the battery with some kind of circuit protection. Otherwise, a wire must be run through the firewall and connected directly to the battery with an in-line circuit breaker. JoeCamper, EwwwBugs, 4 kids, 2dogs and whatever else fits in my truck.